NETWORK FINALS: On CBS, SURVIVOR gained 0.1 in final numbers, but MILLION DOLLAR MILE dropped the same, putting it at an unimpressive 0.9. Elsewhere, the reruns of SCHOOLED and MODERN FAMILY each lost 0.1. Notably, after last week’s upward adjustment, EMPIRE stayed at its new series low 1.1 (and STAR was unchanged as well). CABLE HIGHLIGHTS: FX’s WHAT WE DO IN THE SHADOWS had a moderate premiere at 0.21. On Syfy, after THE MAGICIANS rose 0.03 to 0.19, the season premiere of HAPPY was at 0.11, down 0.29 from last season’s premiere, and also down 0.08 from the finale. 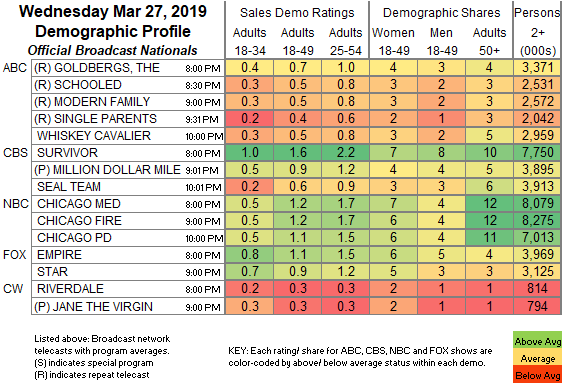 MTV’s THE CHALLENGE led Wednesday cable, up 0.06 to 0.63, with lead-in RIDICULOUSNESS at 0.30/0.28, compared to last week’s 0.23/0.23, and a lead-out hour at 0.19. ESPN’s NBA doubleheader was at 0.48/0.40. VH1’s BLACK INK CREW ticked down to 0.47. Bravo’s REAL HOUSEWIVES OF NYC rose 0.06 to 0.44. Fueled by a Trump interview, it was a big night for Fox News’s HANNITY, which at #5 dominated cable news at 0.42/0.65/4.3M, with MSNBC’s RACHEL MADDOW SHOW at 0.22/0.36/2.7M, and CNN’s Cory Booker TOWN HALL at 0.18/0.22/900K. Food Network’s GUY’S GROCERY GAMES climbed 0.08 to 0.32. TLC’s MY 600-LB LIFE ticked up to 0.31, with a lead-out hour at 0.23. 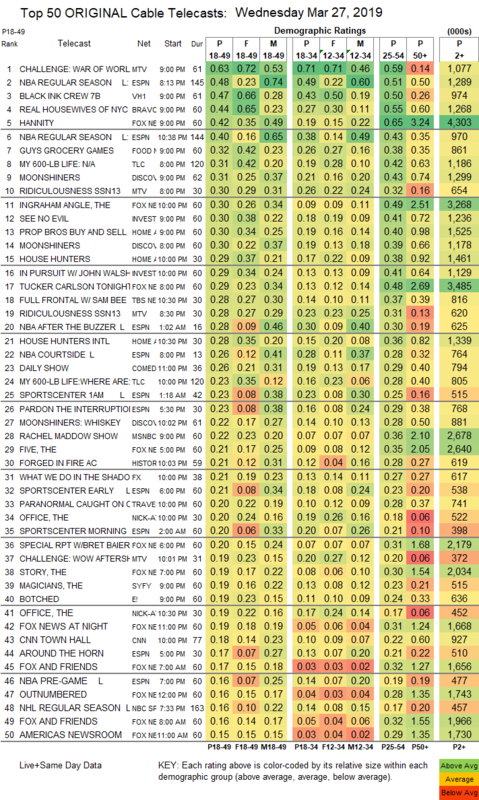 Discovery’s MOONSHINERS was at 0.31/0.30, compared to last week’s 0.31/0.29, and with the lead-out hour down a tick to 0.22. On ID, SEE NO EVIL gained a tick to 0.30, and IN PURSUIT was down 0.02 to 0.29. On HGTV, PROPERTY BROTHERS edged up 0.02 to 0.30, HOUSE HUNTERS was up a tick to 0.29, and HOUSE HUNTERS INTL also grew by a tick to 0.28. TBS’s FULL FRONTAL dipped 0.03 to 0.28. E!’s BOTCHED was steady at 0.19. OWN’s IF LOVING YOU IS WRONG fell 0.07 to 0.14. On Lifetime, PROJECT RUNWAY held at 0.14, and AMERICAN BEAUTY STAR was at 0.05. On TNT, DROP THE MIC gained 0.04 to 0.13, and THE JOKER’S WILD ticked up to 0.08. On A&E, ZOMBIE HOUSE FLIPPING was at 0.07/0.11 compared to last week’s 0.09/0.09, and TINY HOUSE NATION was steady at 0.09. Freeform’s THE PERFECTIONISTS crashed by 0.09 from last week’s premiere to 0.09. FXX’s YOU’RE THE WORST held at 0.07. POP’s SCHITT’S CREEK ticked down to 0.06. WGNAmerica’s GONE was steady at 0.05. The season finale of IFC’s DOCUMENTARY NOW ticked up to 0.04.